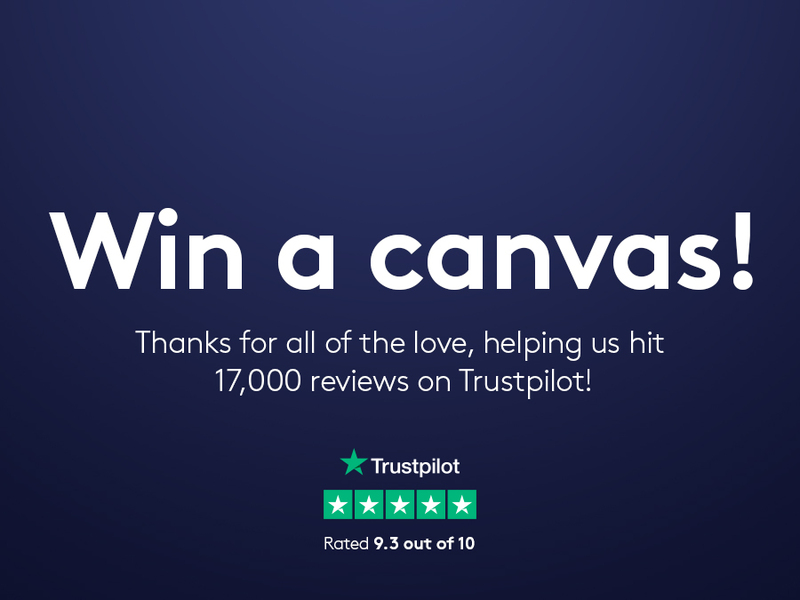 We’ve recently hit 17,000 reviews on Trustpilot and we couldn’t be more grateful to our customers who over the years, have provided us with honest feedback. As a thank you to all of you, we’re giving away four 24″ x 24″ canvases. You have a chance to win any one of these by entering through four social platforms. Just simply follow our accounts, then like and share any of our competition posts about this on Twitter, Facebook, Instagram and LinkedIn. The competition will run from today and close on 23rd October at 11:59pm. You can enter all four of our separate competitions. Please be sure to read the full terms and conditions below. Best of luck! T&Cs (Posted onto the blog with details of entry and instructions): This competition is open to UK residents aged 18 or over. Employees of Solopress are not eligible to enter. Competition closes on 23rd October at 11:59pm, all entries after this will not be accepted. There will be 4 prizes in total across 4 platforms (Twitter, Facebook, LinkedIn & Instagram), one prize per platform. To enter you must follow us, share and like our competition posts. These follows, likes and shares need to remain until at least 1 week after the competition closes for verification purposes. Undoing these actions before 30th October at 11:59pm will invalidate your entry. You may enter all 4 different platform competitions but multiple shares, comments, etc will not count as additional entries. Only one entry per person, per platform. The winners will be notified by direct messaging. The winner will be announced over each platform on 6th November. Winners will also be required to take photographs of their win once received so we can use for a winner’s blog and proof of receipt. If we are unable to make contact with you to arrange your prize within 72 hours, we reserve the right to draw an alternative winner. The prize cannot be exchanged for cash and is non-transferable. This competition is now closed, any further entries past the cut-off date listed in the T&Cs won’t be accepted.